London Marathon is this Sunday and a lot of the pre-race hype has been (rightly) focussed on the quartet of A-list Kenyans on the start line. Selection of the Kenyan Olympic Marathon squad has been an international talking point in running circles. Who will they pick, who won’t they pick, what do they need to run? And so on. But enough about that. I want to talk about a little Eritrean named Zersenay Tadese. Anyone worth their salt knows a pretty rock solid rule about marathoning. To be a good marathoner, you need to have run a good 10k (and half marathon). Name any great marathoner and look at their 10k. It will be the business. Arguably the world’s best over 26.2, the late Sammy Wanjiru, went well under 27 minutes on the track before he stepped up. However, and this is the point, the converse is not true. Being a quality 10k and half marathon guy does in no way guarantee you success over a marathon. The fact is no-one really knows how they will fare over a marathon until they actually run one. There are probably a few high-profile distance men and women who haven’t reached their marathon potential. 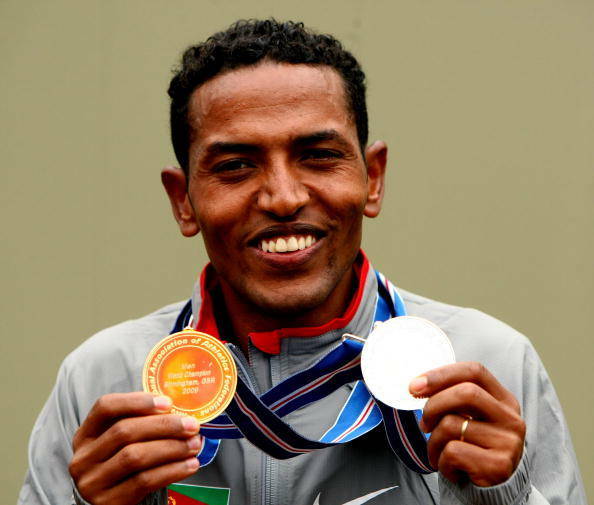 (In as much as “potential” is determined by 10k and HM performance) but none are as high profile as Zersenay Tadese. If ever there was textbook case to highlight the lack of conversion rule, it is Zersenay. Remove his marathon attempts from this discussion and his distance running CV becomes pretty much as good as it gets. Kenenisa Bekele may have had his number of the track thanks to an indomitable finishing kick, but Tadese didn’t do too badly behind him. A 10k in less than 27 minutes? Check. A half marathon in less than 60 minutes? Check. In fact a half marathon in less than 59 minutes. In fact the WORLD RECORD HOLDER in the half marathon in 58:23. Ok, how about championship racing? Any medals on the track at global level? Check. (No titles maybe, as time and again KB put paid to any chance of that). But he has a bronze from the Athens Olympics 10k and a silver from the 2009 Berlin World Champs. Any medals at World Cross Country level? Check. 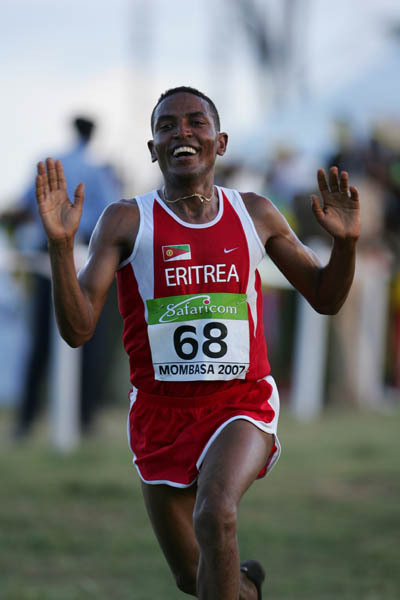 In the toughest race of them all, the World Cross Country Championships, Zersenay beat the world, and KB, in 2007 (KB dropped out of the race with a lap to go). He also has an individual silver and two individual bronze medals in World Cross to go with that gold. Now, the final question, what is he like on the road? I’m glad you asked. Ignoring the marathon, he is probably the greatest road runner of all time. World HM Record Holder, four-time World Half Marathon Champion and a World 20k title for good measure. It’s a pedigree anyone would aspire to. So imagine the buzz around the running world when he decided to run his first marathon. It was a few years back, London 2009. The world waited with baited breath. Zersenay’s debut in the marathon coincided with a big step-up that was currently taking place in the world of international marathoning. He arrived on the scene, with marathoning on a big and aggressive up-curve, and was caught out by experienced marathoners, led by Wanjiru. They aggressively attacked at all points in the race and pushed a ridiculously fast early pace. Zersenay lasted as long as he could before dropping out. The following year, 2010, he returned, to a similarly aggressive racing environment. With slightly more battle experience, this time he finished. But his 2hr12 was widely accepted as nowhere near a true indication of his capabilities, and again the field had beaten him up and left him behind. In 2011 it seemed he decided to take a break from London and move his focus back to the areas in which he had excelled and enjoyed success, the 10k on the track, and the half marathon. Skip to the announcement of the 2012 London Elite Field and his name is back on the list. In early 2012 he ran the Lisbon Half Marathon, the course where he set the current world record, 58:23. It was billed as a World Record Attempt but he ended up running about a minute off that pace, finishing in 59:34 for his third title in a row. The gurus at LetsRun have spoken at length about proper focus on a marathon resulting in a runner that should not be sufficiently sharp to run a half marathon PB in their marathon buildup. If this is true, and I personally subscribe to the same belief, then Tadese may just be perfectly poised for this year’s London. Most of us love to see hard-running, hard-working athletes perform at the highest level, and Zersenay Tadese is the hardest working, hardest running of them all. Over the years he has become one of my all-time favourite and most inspirational athletes. Come Sunday morning, I will be hoping he gets into his familiar groove, seen so many times at the front of races around the world, in the lead pack and survives, or ignores, any suicidal pace changes during the race. In amongst the Kenyan whirlwind of class and ability, and pressure, I would love to see nothing more than the little Eritrean powerhouse slide in under the radar and knock 5+ minutes off his best time, and get his marathon time down to the level befitting a guy of his pedigree. Heck I hope he wins the entire race. It’s a long shot, but optimism never killed anyone, right?